The shooting for MBC Wednesday and Thursday drama series The Moon that Embraces the Sun has generally ended. PD Kim Doh Hoon said goodbye to the actors, attracting attention. On March 8th, 2012, PD Kim Doh Hoon tweeted through his Twitter account, “I can understand that brothers are working very hard. 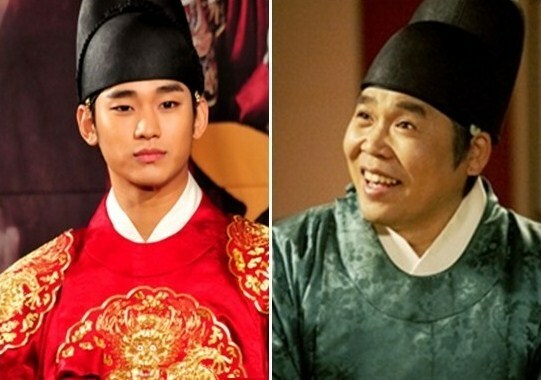 I will never forget two of you.” The comment was addressed to Kim Soo Hyun who played the role of Lee Hwon and Jung Eun Pyo who played the role of Hyung Sun in the drama, expressing his sad mood of about to parting. The two actors filmed their last scenes on the filming set at Yongin, Gyeonggi-do on March 8th, 2012. After the end of the filming, the actors shed tears of regret. It is learned that it’s because it’s hard to even prepare to say goodbye psychologically after been together for so long. In this regard, PD Kim Do Hoon also expressed gratitude to the actors who persisted to the end. On the other hand, The Moon that Embraces Sun has only two episode remaining. The drama will come to and end on March 15th, 2012 with the grand finale under the spotlight.